Yet another trip out shooting the stars last night. This is becoming very addictive. Moon was at 41.9% illumination (waxing) which means the period that runs between the New Moon and the Full Moon. This is a combination of moon light and ambient light from the surround suburbs and peoples headlights. Single image capture. Now I just got to think up my next location and what sort of shooting combination I want to do… maybe sunset into a star trail… you will have to wait and see. 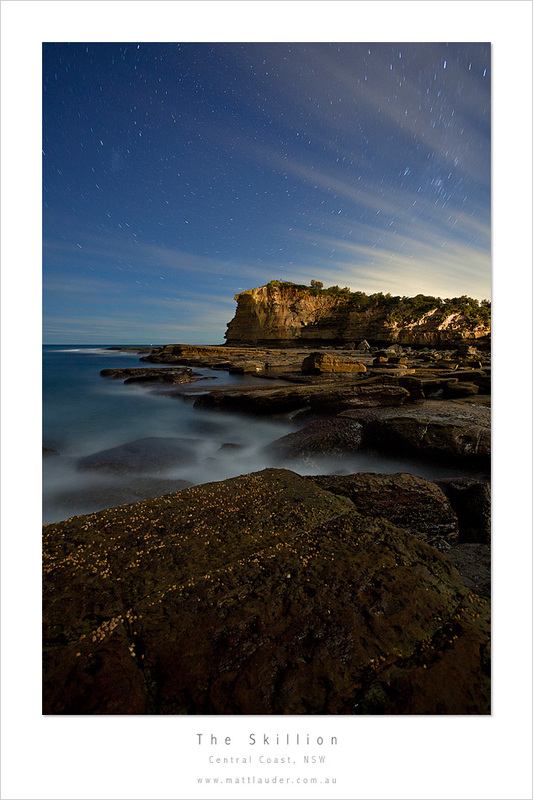 This entry was posted in Uncategorized and tagged night photography, Photography, skillion, star trail, terrigal. Bookmark the permalink. great shot here! I can’t wait to see your next one. they just get better! this one is realy nice! Woa! Woa! Woa! I can see there is going to have a second “Peter Lik” showing up in the photography field. Very nice shot Matt, great capture.